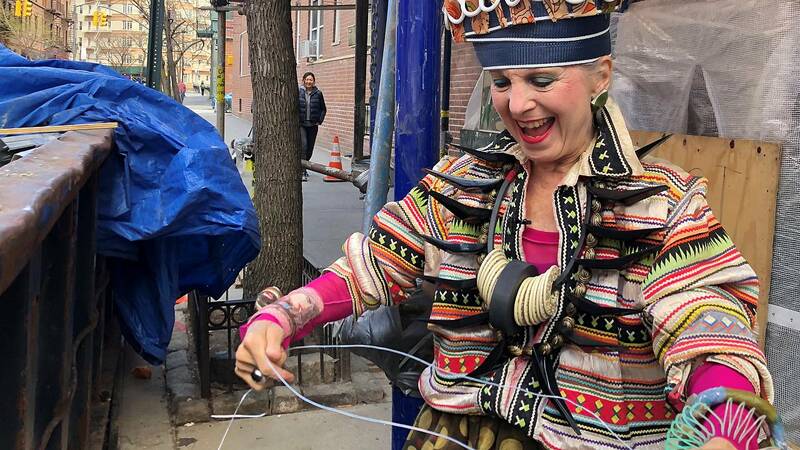 An old newspaper, a piece of metal, a toilet paper roll - whatever it is, artist and style icon Debra Rapoport is ready to use it for her next one of a kind creation. She is known since the late 1960s for her wearable art pieces. And for these, she often happens to find raw material hidden in a dumpster in New York City. Rapoport, 73, turns other people's trash and simple materials like paper towels and toilet paper rolls into high-end fashion. She calls herself "Debra Debris" or "Residue Rapoport." Her work has been exhibited in the Metropolitan Museum of Art, the Philadelphia Museum of Art, Smithsonian American Art Museum and more. After receiving her master's degree at the University of California at Berkeley, she's taught at various universities and given workshops on how to turn recycled materials into creative and beautiful hats, handbags and necklaces. "You don't have to dress like me, but whatever makes you feel good, you know, play with that," she says. "You're bringing joy to the environment because people will stop you on the street and give you a smile or make a comment. And you know, that just sets up a good rapport. It's community." For the past five years, she's been making hats out of Viva brand paper towels, which she says ranges from $250 to $400. "The paper towels are just right there on a roll, I could make 10 hats out of a roll of paper and I can manipulate it just like I did with fabric and fiber, which was my background that I've been doing for 50 years," she says. "Anything looks good on the head if you wear it right. And then the minute you put it on, you got 'hattitude,' something happens, whether you like it or not." Click on the video to watch more of Debra Rapoport's creations. Can jewellery ever be eco-friendly?